Since 1989, Pivotal Labs has been a leader in agile (XP) software development consulting for startups and Fortune 500 companies. Pivotal established a reputation for delivering efficiently, and on-time by helping, then startups, now industry leaders such as Google, Facebook, Square, and Twitter deliver apps and with teams trained to maintain those apps. Establish and develop a Design practice and process that integrates with Engineering to deliver products in an agile fashion. 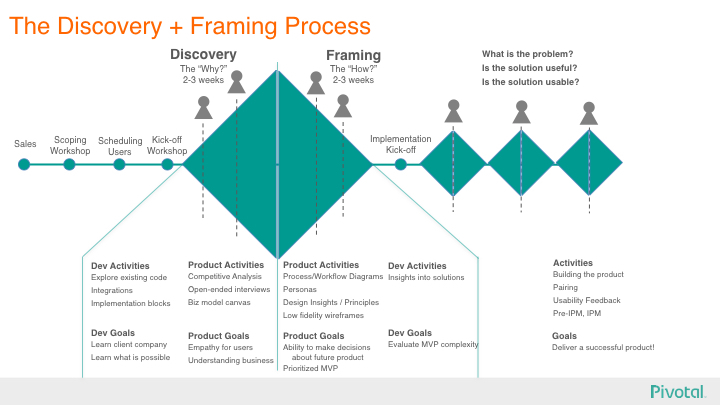 Train & mentor Product Managers, Product Designers, and Engineers in Discovery & Framing process. Allow Pivotal to take on clients with earlier stage products than previously possible. Integrated product development teams of Product Managers, Product Designers, and Software Engineers that can now take on clients with earlier stage products than previously possible. Delivered products that add more value to end users and the revenue that goes along with that. Collaborated with Kim Dowd, Design Practice Lead, to establish and develop Discovery + Framing process across Pivotal Labs 18+ offices. Incubated Discovery + Framing offering in Los Angeles office to refine methodologies and best practices. Shared Los Angeles project case studies to teach Discovery + Framing process across Pivotal Labs' 18+ offices. Developed training and coached Los Angeles Product team members to ensure successful execution of Discovery & Framing process, ultimately delivering software with product-market fit. Grew Pivotal’s revenue by expanding the services that Pivotal offers. D + F process allowed Pivotal to engage earlier stage clients than previously possible. Clients without mockups to be built, needing help getting from idea to a defined product, can now be serviced by Pivotal.